The 25th death anniversary of S Nadesan (Q.C), a front rank lawyer, a crusader for human rights, a senator and an aggressive champion of social justice falls today, December 21, 2012. Nadesan (Q.C) graced the Bar for 55 years and lived upto his 83rd year. In fact, he stood up for certain principles, regardless of consequences. He had one of the most incisive and logical minds and for counsel of his eminence there was no distinction between civil, criminal or constitutional matters. He handled all of them with equal facility and left his indelible impression in all branches of the law. Lord McMillan once said that the duty of the advocate is five fold. In the discharge of his office the advocate has a duty to his client, a duty to his opponent, a duty to the court, a duty to himself and a duty to the State. To maintain a perfect poise amidst these various and sometimes conflicting claims is no easy feat. However Nadesan performed this feat with ease. He would graciously concede matters of fact or law, even if they were unfavourable to his case. Further, future generations will remember him not merely for his triumphs at the Bar, but for the dynamic and valiant efforts he made throughout his long and eventful career, to preserve through the judicial process, the cherished values of any democratic society. Indeed, he was a champion of Democracy. In a country whose constitution proclaims that it is a Democratic Republic and many have to protect that they cherish democratic ideals. They do so as mere slogans to be forgotten as quickly as they are uttered. But, Nadesan in his sagacity knew that those cherished ideals were indispensable for the progress of a nation, that there could be no progress without a sense of national dignity and national dignity comes only when each and every citizen knows that each and every other citizen is assured of fair play. It is this pre-occupation with fair play which made Nadesan such a relentless fighter against arbitration and corruption. Yet, Nadesan was not dogmatic in any matter. He could always be persuaded to change his point of view. A classic instance was when Nadesan as a ‘Senator’ supported the infliction of the death penalty. Later he acknowledged the total irrationality of the death penalty and became a member of the committee for the arbitration of the death penalty. Nadesan passed away from our midst on December 21, 1987, but his services were much in demand in the several courts and tribunals in the island. It could be said of several that they specialized and made their mark in the civil or criminal side or in the original or appellate court or in some commercial subject or other. But, it can be said of only Nadesan that he was an all-rounder, quite at home whether it be in the privy council, Supreme Court, Election Court, the Income Tax Board of Review, or Industrial Arbitrator or Parliamentary Committee. In 1943, during the height of the second world war when Ceylon was a Crown Colony Nadesan appeared in the Colombo Assize Court for Mr Aziz, who faced a charge of sedition and secured an acquittal in spite of a hostile Bench. The secret of Nadesan’s success as a lawyer was his keen sense of relevancy, his grasp of fundamental principles of law and his uncanny perception of the weak points in his opponent’s case. He had the flair for detecting the flaws in his opponent’s case and reasoning. He never bullied witnesses, but would laugh with an adverse witness and laugh out the opposite party’s case. Nadesan ably expounded the cause of the freedom of the press when he challenged the Press Council Bill before the Constitutional Court in 1974. 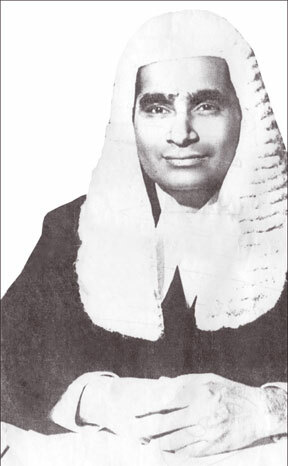 The 1978 Constitution gave the opportunity to Nadesan to expatiate on fundamental rights, when such rights were made justiciable before the Supreme Court. He was a passionate advocate of fundamental rights. His exposition of fundamental rights gave a new dimension to the concept of fundamental rights. He was dedicated to the championship of human rights. Furthermore, his sober, enlightened and critical contribution to the Senate debates indicated the high regards in which he was held by all the political parties of the day. Nadesan believed not only in a sound mind, but also in a sound body. He was a versatile personality who made a lasting impact in the sphere of law and politics. He was a class by himself. He can never be imitated. He had left a void in the legal world and the civil rights movement had lost one of its founder members and an ardent human rights activist and the country had lost a pre-eminent lawyer with a social conscience.